The Fiat-Ansaldo M15/42 is a Rank II Italian medium tank with a battle rating of 2.3 (AB/RB/SB). It was introduced in Update 1.85 "Supersonic". The M15/42 is the last tank before getting to the P40 and foreign medium tanks and is the final version of the Carro Armato, thus giving some notable improvements over the previous models. The best way to describe the overall armour on the M15/42 is "Adequate". The turret is only 25 mm at the side, but due to the roundness and the slope of the armour at the front of the tank, it has an effective thickness of ~70 mm which can bounce poorly aimed shots. The Manlet has two layers of armour stacked on top of each other, giving an effective thickness of 75 mm, however, it has a shot trap on the left side which only has a thickness between 29 mm and 49 mm however due to the low battle rating, most new players won't know to shoot there. Despite the shot trap, the combination of good, sloped and rounded turret armour can make the M15/42 effective at hull-down positions. The top of the hull has decent protection in the form of a 50 mm frontal plate and a ludicrously sloped 80° 20 mm plate which has an effective thickness of ~75 mm. 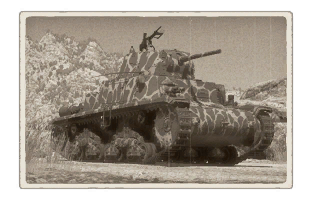 However, the lower Glacis plate only has a thickness of 30 mm and is directly in front of the transmission, so shots there will cripple the tank's mobility and possible result in the player's destruction. The M15/42 is not a shining star on the battlefield, however, when it comes to mobility, this medium tank can get around. While being understandably significantly slower than most light tanks encountered at this battle rating, it can hold it's own over most terrain as a medium tank, sacrificing armour for mobility. The 47/40 mod.38 is quite the powerhouse at this rank, especially due to the effective shells at its disposal. The Mod.39 shell has a decent muzzle velocity of 755 m/s, good post-penetration damage and adequate penetration at close ranges. However, it quickly loses effectiveness at longer ranges. This encourages the player to fight in the mid-range area, almost always in a hull-down position. This page was last edited on 22 April 2019, at 16:11.